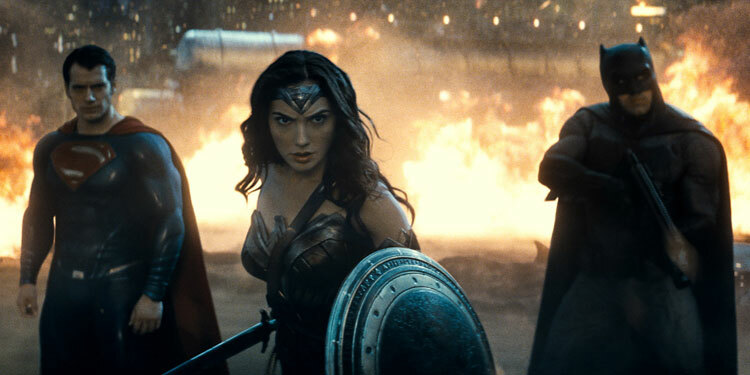 DC and Warner Brothers are reaching for the financial success that Marvel has had with their cinematic universe (MCU), but the tone of their films set the studios apart. Marvel films are more light-hearted whereas DC’s recent films have mainly been darker (excluding the Schumacher Batman movies). Despite the darker tone I enjoyed Man of Steel up until the finale, where it seemed like the production had $100 million left and spent it needlessly destroying Metropolis. But it didn’t feel like a Superman movie and lacked the charm of Richard Donner’s 1978 version. But the destruction of Metropolis was the catalyst that opened up a bigger world full of superheroes and villains, and we see from this film’s opening that Bruce Wayne / Batman (Affleck) was there and is not happy about the prospect of aliens with god-like powers. 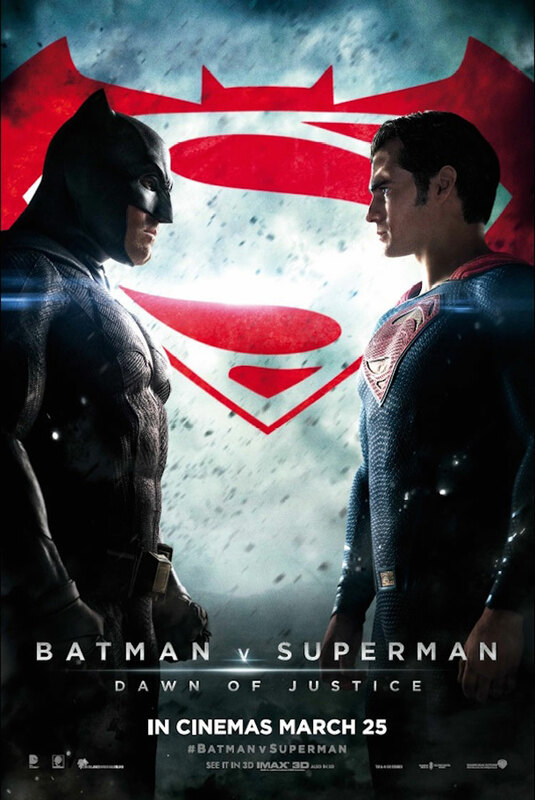 The film mainly takes place 18 months after Man of Steel, Lois Lane (Amy Adams) and Clark Kent / Superman (Cavill) are a couple, Kent is concerned about Batman’s methods of justice, the world is coming to terms with Superman and many politicians are conflicted as to how to deal with and accept him as an illegal alien with uncontrollable power. Batman sees him as a potential time bomb and so does Lex Luthor (Jesse Eisenberg), and we see a convoluted yet entertaining plot that will eventually lead to the clash of the legends. And it’s just a shame that five minutes before the fight the film just becomes stupid. I would love to write a spoiler filled rant about this film but I always intend to keep my reviews as spoiler free as possible. I take comic book movies with a big pinch of salt but the whole reason why they fight is stupid and the reason the fight ends is equally as stupid. And then there is another fight that is stupid, the ending is dis-jointed and, as with Man of Steel, the last half an hour is a CGI smash fest which feels more like a cartoon than a comic. This is a shame as the film has access to not only Frank Miller’s excellent The Dark Knight Returns comic but DC’s entire back catalogue of stories and characters to utilise, and although this movie has some good ideas it fails to do anything with them and a lot of the plot is convoluted and unnecessary. The main characters are conflicted, secret identities are known and quite a few things should have been cut or simplified and I wonder if the three hour directors cut will fix some of the plot issues or just dilute the film. As a big Batman fan it was hard not to get hyped about this movie and when Ben Affleck (Batflek) was announced I was one of the few who thought he was perfectly cast as an older Bruce Wayne. He is introduced as a ghoulish daemon and it’s good to see this side on screen. He has been fighting for 20 years and wants this last fight to count. But unfortunately he is a bit too stubborn for my liking and as such becomes a thoughtless thug towards the end, being brutal and surprisingly killing a lot of people throughout this film. That being said I am still looking forward to the solo Batfleck movie, especially if Affleck is attached to direct. Cavill is great as Superman but poor as Clark Kent. There just doesn’t seem to be much of a difference between the characters, which is a shame as Christopher Reeves nailed the duality of the role perfectly. This film is a better Superman film than Man of Steel, although it would have been good to acknowledge that he is the last of his kind and explore that side a bit. But he does state that he can kill Batman if he truly wants to, because in all fairness Batman wouldn’t last a second in a proper fight. Lex Luthor (Jesse Eisenberg) isn’t really the twisted criminal mastermind that we know and love, but more of a spoilt brat with a god complex and a fascination with ‘meta humans’, and I couldn’t help but see a more delusional Mark Zuckerberg from The Social Network (2010). He’s another character who has potential in this film but his plans and motives don’t make any sense. We have a wealth of other characters old and new with Jeromy Irons portrayal of Alfred being one of the best things in this movie. Although Wonder Woman (Gal Gadot) is a central character, her appearance seems more like an extended cameo and we don’t get a lot of back story (her film is out next year) but Gadot is great in the role and I for one am looking forward to her solo film. But as I feared there is a lot to fit into this film and the introductions of the other members of the Justice League are brief and like many things in this movie should have been done better or just left out. A lot of this film’s problems can be solely blamed on director Zack Snyder. The Dawn of the Dead remake (2004) and Watchmen (2009) are two films that shouldn’t have worked but did, but unfortunately this film doesn’t. It starts out great but descends into a mess of ill thought out ideas and then tries its best to tie it all together for a climax that didn’t deliver. The narrative is unstructured in some scenes, and the Batmobile chase sequence was spoilt by too much CGI. But there are a lot of positives about this film. It hits the ground running and the pace throughout is great and doesn’t sag despite its running time. We see many familiar characters already established and it doesn’t waste too much time retelling Batman’s origin. There are some humorous and heartfelt moments plus plenty of in-jokes and references that the fans will love. The cinematography is fantastic (including just the right amount of slow motion), Superman gets a great heroic montage and the scene where Batman rescues a character is straight out of the Arkham games and was my favourite part of the movie. Overall Verdict: It’s an enjoyable mess that falls apart as it progresses and doesn’t live up to its potential. Some characters are wasted and it doesn’t really create the interest it should for future DCCU instalments. Affleck and Cavill are great but this film doesn’t live up to its potential. It could have been a lot worse, but should have been a lot better. You are dead wrong on this review. Fans of superhero movies, especially darker ones, will love this movie. Comic book fans won’t, but then they never do. BTW, Man of Steel was perfect! But I haven’t read the comics. I always felt like I missed out as a kid. But I’m glad I never read them. It seems like anyone who grew up with comics hates the movies. I love them all! Yes, even Green Lantern.